I had to swing by Michaels Craft store to pick up a new can of spray varnish this weekend. 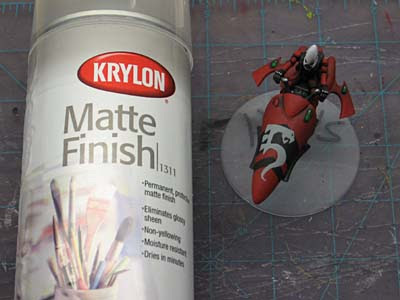 I was just about out with my old can and I've got a backlog of jetbikes that need to be varnished. Shake well, use in a suitable environment (even though I don't always follow that part) and you should be able to avoid the dreaded "FROST" that seems to strike without notice and gets us all at least once. If you do get the "FROST," the good Admiral Drax discovered a way to get rid of it. If it happens, a little bit of rubbing alcohol (surgical spirits) lightly painted over the frost should take it right away. Let the model re-dry and you're back in business. 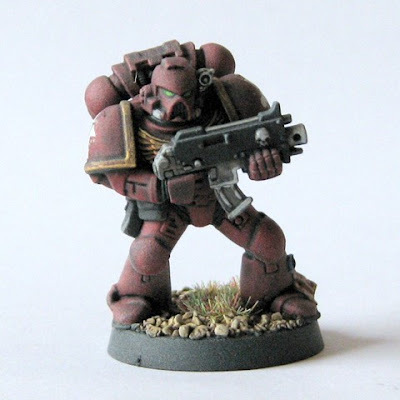 There is a FTW Collaborative Post on varnishing without frosting here. UPDATE: Since this post is old, it's worth mentioning that I no longer spray varnish my models. Since I don't game much and my models sit in a display cabinet, there is no need to do it. If you're a gamer though, it's worth doing your research before you run the risk of destroying hours of your hard work. That tip on removing the frost is brilliant! Col. Corbane: You can thank Admiral Drax... he's the one who deserves the credit here. I'm just passing along what he learned the hard way. The Frost effect happens because the varnish did not dry smooth and light is refracting over the bumpy surface causing the effect of frosting. Another good way to get rid of it is just to varnish the model again.